In today's work world, building a team often has less to do with the actual people in your company and more to do with the ad-hoc pool of talent that contributes to any given project. So, while enterprise collaboration tools are great, they're often ineffective for bringing a loose-knit team together because freelancers, contractors, and consultants don't typically have access to the same network and tools. One good solution that works well for groups of independent workers is Microsoft Windows Live Groups. Built around Microsoft's Office Web apps, SkyDrive, and Hotmail (no, you don't have to actually use Hotmail), this simple collaboration setup gives you a single hub for shared documents and calendars, and bundles in the flexibility of group messaging if you use Microsoft Live Messenger. Live Groups straddles the fuzzy gray line between the business cloud and the personal cloud, but it works effectively for both. It's by no means a full-fledged project management system. This can be a good thing when you just need to get down to sharing ideas and assets and don't want to burden your team with the hassle of bureaucratic tracking features. 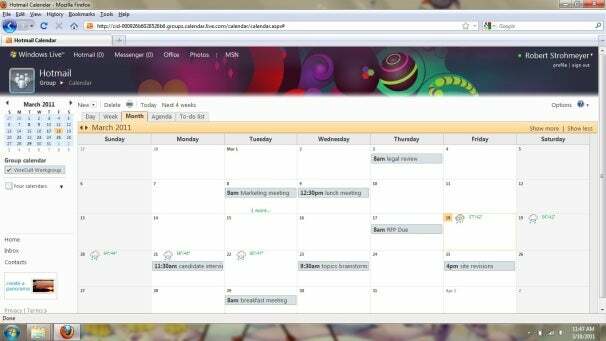 For calendars and documents, Live Groups has a few distinct advantages over Google's web apps. The first is that it creates a stand-alone page that aggregates all of the stuff your team creates around the shared project. Office documents, calendar updates, and photos appear in the left column, with the most recent changes at the top, where everyone can get to them quickly. Events and actions, such as someone updating a Word document or modifying a meeting agenda, appear in the center column, so you can see at a glance what other members of the group have done lately. Live Groups lets you assign more than one co-owner to a group, for easier administration. By default, however, new members have only basic permissions to add and edit documents, and can't invite new users to the group or change the group's settings. For me, the most compelling thing about Groups is that it lets you edit documents either directly in the web interface or in Microsoft Office 2003 and later on Windows or Office 2008 or later on the Mac. So if you're tired of sharing documents in Google Docs' clumsily simplistic interface and want to retain the formatting of your Word or Excel documents, you can stick the more robust tools you trust. And we might as well face it: Everyone's using Microsoft Office anyway. Live Groups is far from perfect, of course, and it only really works well on either very small projects or with very small groups. Once you have more than about five or ten people collaborating on something, it'll be time to step up to a more business-grade solution. Still, I'm impressed with the simplicity of this little tool. I can only hope Microsoft will continue to bridge the gap between Live Groups, Office, and Windows to give users a more seamless way to drop in files, get updates, and send messages to the group.